Ernest Joseph King was born on November 23, 1878, in Lorain, Ohio. He attended local schools and, as a youth, dreamed of attending the United States Naval Academy in Annapolis, Maryland. King received his wish in 1897. Even before graduating from Annapolis, King found himself in combat situations. In 1898, during the Spanish-American War, King served as a cadet aboard the USS San Francisco. 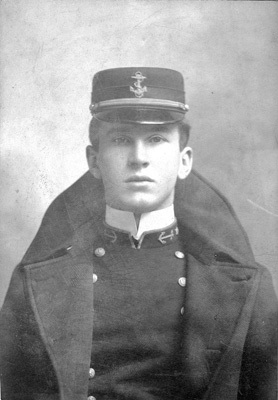 He graduated from Annapolis in 1901, and King spent the next two years at sea, on several different ships, before receiving his commission as an ensign in 1903. In 1906, King returned to the U.S. Naval Academy as an instructor of ordnance and gunnery. In 1908, he also served on the academy's executive staff. In 1909, he returned to active duty, spending the next several years assigned to various higher-ranking officers' staffs. During World War I, he served on Admiral H.T. Mayo's staff, the commander-in-chief of the United States Navy's Atlantic Fleet. Following World War I, King returned briefly to Annapolis as the head of this institution's post-graduate program. With this assignment's conclusion, King continued to serve on various staffs and gained experience with both submarines and airplanes. He was certified as a naval aviator in 1927. Due to his extensive experience, during the 1930s, King emerged as one of the most prominent officers in the U.S. Navy. At various points, he served as Assistant Chief of the Bureau of Aeronautics, commander of the Naval Air Station at Norfolk, Virginia, the Chief of the Bureau of Aeronautics, and commander of the Aircraft Base Force, the Aircraft Scouting Force, and the Aircraft Battle Force. In February 1941, King became the Commander-in-Chief of the Atlantic Fleet. He held this position until World War II's outbreak in December 1941, when he became the Commander-in-Chief of the U. S. Fleet. Due to King's extensive experience with aircraft, submarines, and various types of ships, not to mention his extensive schooling and command experience, in March 1942, President Franklin Delano Roosevelt combined the office of Commander in Chief of the U.S. Fleet and the Chief of Naval Operations. He appointed King to this position. King was the only person to hold this office. In 1944, he attained the rank of fleet admiral. Upon the war's conclusion in 1945, King assumed an advisory role for the Secretary of the Navy. He also served as president of the Naval Historical Foundation. King died on June 25, 1956. He began his life as a boy from a small Ohio community. He eventually rose through the ranks of the U.S. Navy to become this branch's highest-ranking officer during World War II.